Basil I (ca. 830-886) - Emperor Basil I would be considered an historical figure based solely on the fact that he is considered one of the most successful monarchs in Byzantine history. But the fact that he was a peasant who rose to rule one of the most powerful empires in the Middle Ages makes him even more remarkable. The story of his ascension begins when his family escaped from captivity in Bulgaria and went to Thrace. He was able to find work as a horse groom in the service of a man named Theophilitzes (who was related to Emperor Michael III). 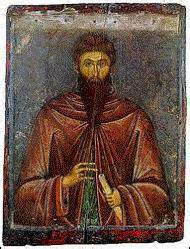 While in Theophilitzes' service, he traveled to the city of Patras and met a wealthy widow named Danielis. The nature of their relationship is unclear (they did not marry), but for whatever reason, she left him her fortune and he became rich. Eventually, the emperor himself took notice of him when he beat a Bulgarian champion in a wrestling match. The emperor hired him as his own personal bodyguard. Now in the emperor's court, he made a move which elevated him even further. The emperor's uncle, Bardas, held the title of Caesar (which was one step below emperor). Basil convinced Michael that Bardas intended to murder him and become emperor himself. On Michael's orders, Basil murdered Bardas instead, and took over the office of Caesar. Now it was he who was one step from emperor. After a couple years, the two men had a falling out, and Basil was worried that Michael would have him replaced. So Basil had him assassinated and was automatically promoted to emperor (Michael had been an unpopular ruler, so no one seemed to care that he was assassinated). Despite the fact that he had to kill two people in order to take power, he was considered both a popular and successful leader. This despite having no formal education or training, and no military or administrative experience. He became emperor in 867 and reigned 19 years. Under his rule, the empire's borders expanded and he kept the Abbasid Caliphate at bay. At the same time, he maintained good relations with Rome. He founded the Macedonian dynasty which lasted for two centuries. So successful was he, that he is sometimes referred to as the "second Justinian".